This document was submitted to the HTML Working Group as an Unofficial Draft. If you wish to make comments regarding this document, please send them to public-html@w3.org (subscribe, archives). You may send feedback to public-html-comments@w3.org (subscribe, archives) without joining the working group. All feedback is welcome. Publication as a Unofficial Draft does not imply endorsement by the W3C Membership. This is a draft document and may be updated, replaced or obsoleted by other documents at any time. It is inappropriate to cite this document as other than work in progress. The set of source IDs that are providing the selected video track and the enabled audio tracks. An ID registered with sourceAddId() that identifies a distinct sequence of initialization segments & media segments appended to a specific source buffer. A hypothetical buffer that contains the media segments for a particular source ID. When media segments are passed to sourceAppend() they update the state of this buffer. The source buffer only allows a single media segment to cover a specific point in the presentation timeline of each track. If a media segment gets appended that contains media data overlapping (in presentation time) with media data from an existing segment, then the new media data will override the old media data. Since media segments depend on initialization segments the source buffer is also responsible for maintaining these associations. During playback, the media element pulls segment data out of the source buffers, demultiplexes it if necessary, and enqueues it into track buffers so it will get decoded and displayed. sourceBuffered() describes the time ranges that are covered by media segments in the source buffer. 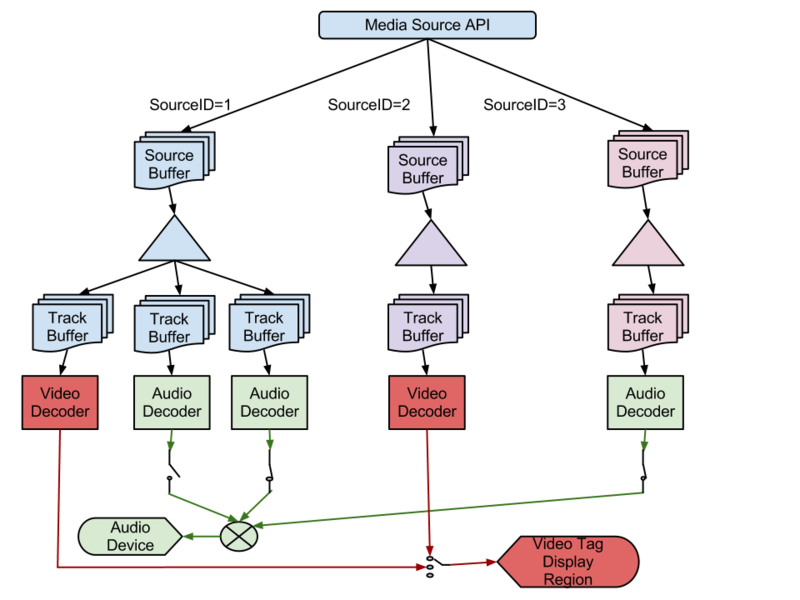 A hypothetical buffer that represents initialization and media data for a single AudioTrack or VideoTrack that has been queued for playback. This buffer may not exist in actual implementations, but it is intended to represent media data that will be decoded no matter what media segments are appended to update the source buffer. This distinction is important when considering appends that happen close to the current playback position. Details about transfers between the source buffer and track buffers are given here. Creating a new source buffer is initiated by calling sourceAddId(). This method allows the web application to specify the source ID it wants to associate with a new source buffer and indicates the format of the data it intends to append. The user agent looks at the type information and determines whether it supports the desired format and has sufficient resources to handle a new source buffer for this device. If the user agent can't support another source ID then it will throw an appropriate exception to signal why the request couldn't be satisfied. Updating the state of a source buffer requires appending at least one initialization segment and one or more media segments via sourceAppend(). The following list outlines some of the basic rules for appending segments. A whole segment must be appended before another segment can be started unless sourceAbort() is called. Segments can be appended in pieces. (i.e. A 4096 byte segment can be spread across four 1024 byte calls to sourceAppend()). For example, if the first initialization segment has 2 audio tracks and 1 video track, then all initialization segments that follow, for this source ID MUST describe 2 audio tracks and 1 video track. For example, you can't have an initialization segment that specifies a single AAC track and then follows it with one that contains AMR-WB. Support for multiple codecs is handled with multiple source IDs. Gaps between media segments that are smaller than the audio frame size are allowed and should be rendered as silence. Such gaps should not be reflected by sourceBuffered(). Once a new source ID has been added, the source buffer expects an initialization segment to be appended first. This first segment indicates the number and type of streams contained in the media segments that follow. This allows the media element to configure the necessary decoders and output devices. This first segment can also cause a readyState transition to HAVE_METADATA if this is the first source ID registered, or if it is the first track of a specific type (i.e. first audio or first video track). If neither of the conditions hold then the tracks for this new source ID will just appear as disabled tracks and won't affect the current readyState until they are selected. The media element will also add the appropriate tracks to the audioTracks & videoTracks collections and fire the necessary change events. The description for sourceAppend() contains all the details. If a media segment is appended to a time range that is not covered by existing segments in the source buffer, then its data is copied directly into the source buffer. Addition of this data may trigger readyState transitions depending on what other data is buffered and whether the media element has determined if it can start playback. Calls to sourceBuffered() will always reflect the current TimeRanges buffered in the source buffer. The figure above shows how the source buffer gets updated when the end of a new media segment overlaps a segment in the buffer. In this case, the media element tries to keep as much of the old segment as possible. The amount saved depends on where the closest random access point, in the old segment, is to the end of the new segment. In the case of audio, if the gap is smaller than the size of an audio frame, then the media element should insert silence for this gap and not reflect it in sourceBuffered(). An implementation may keep old segment data before the end of the new segment to avoid creating a gap if it wishes. Doing this though can significantly increase implementation complexity and could cause delays at the splice point. The key property that must be preserved is the entirety of the new segment gets added to the source buffer and it is up to the implementation how much of the old segment data is retained. The web application can use sourceBuffered() to determine how much of the old segment was preserved. The source buffer represents the media that the web application would like the media element to play. The track buffer contains the data that will actually get decoded and rendered. In most cases the track buffer will simply contain a subset of the source buffer near the current playback position. These two buffers start to diverge though when media segments that overlay or are very close to the current playback position are appended. Depending on the contents of the new media segment it may not be possible to switch to the new data immediately because there isn't a random access point close enough to the current playback position. The quality of the implementation determines how much data is considered "in the track buffer". It should transfer data to the track buffer as late as possible whilst maintaining seamless playback. Some implementations may be able to instantiate multiple decoders or decode the new data significantly faster than real-time to achieve a seamless splice immediately. Other implementations may delay until the next random access point before switching to the newly appended data. Notice that this difference in behavior is only observable when appending close to the current playback position. The track buffer represents a media subsegment, like a group of pictures or something with similar decode dependencies, that the media element commits to playing. This commitment may be influenced by a variety of things like limited decoding resources, hardware decode buffers, a jitter buffer, or the desire to limit implementation complexity. When a new media segment is appended, memory constraints may cause previously appended segments to get evicted from the source buffer. The eviction algorithm is implementation dependent, but segments that aren't likely to be needed soon are the most likely to get evicted. The sourceBuffered() method allows the web application to monitor what time ranges are currently buffered in the source buffer. Removing a source ID with sourceRemoveId() releases all resources associated with the ID. This includes destroying the source buffer, track buffers, and decoders. The media element will also remove the appropriate tracks from audioTracks & videoTracks and fire the necessary change events. Playback may become degraded or stop if the currently selected VideoTrack or the only enabled AudioTracks are removed. // Manages IDs for appending media to the source. // Returns the time ranges buffered for a specific ID. // Abort the current segment. The mediaSourceURL attribute returns the URL used to enable the Media Source extension methods. To enable the Media Source extensions on a media element, assign this URL to the src attribute. The format of the URL is browser specific and may be unique for each HTMLMediaElement. The mediaSourceURL on one HTMLMediaElement should not be assigned to the src attribute on a different HTMLMediaElement. Note the browser specific scheme and use of a UUID for the path to make it unique. Using mediaSourceURL is one approach to switching the media element into "media source" mode. Alternative approaches should be explored to improve consistency with other APIs and provide a declarative mechanism for enabling "media source" mode. If id is null or an empty string then throw an INVALID_ACCESS_ERR exception and abort these steps. If id specifies an ID that has been previously added then throw a INVALID_STATE_ERR exception and abort these steps. If type contains a MIME type that is not supported or contains a MIME type that is not supported with the types specified for other sourceIDs, then throw a NOT_SUPPORTED_ERR exception and abort these steps. If the user agent can't handle any more IDs then throw a QUOTA_EXCEEDED_ERR exception and abort these steps. If the sourceState attribute is not in the SOURCE_OPEN state then throw an INVALID_STATE_ERR exception and abort these steps. Allocate source buffer resources for id. If the sourceState attribute is in the SOURCE_CLOSED state then throw an INVALID_STATE_ERR exception and abort these steps. If id specifies an ID that has not been previously added then abort these steps. Remove track information from audioTracks and videoTracks for all tracks associated with id and fire a simple event named change on the modified lists. Destroy source buffer resources for id. If id specifies an ID that has not been previously added with sourceAddId() then throw a SYNTAX_ERR exception and abort these steps. Return TimeRanges for the source buffer associated with id. Copy contents of data into the source buffer associated with id. Set readyState attribute to HAVE_METADATA and fire the appropriate event for this transition. If the readyState attribute is HAVE_METADATA and data causes all active IDs to have media data for the current playback position. Set readyState attribute to HAVE_CURRENT_DATA and fire the appropriate event for this transition. If the readyState attribute is HAVE_CURRENT_DATA and data causes all active IDs to have media data beyond the current playback position. Set readyState attribute to HAVE_FUTURE_DATA and fire the appropriate event for this transition. If the readyState attribute is HAVE_FUTURE_DATA and data causes all active IDs to have enough data to start playback. Set readyState attribute to HAVE_ENOUGH_DATA and fire the appropriate event for this transition. The media element may keep any media data it finds valuable in the partial segment. For example if the abort happens in the middle of a 10 second media segment, the media element may choose to keep the 5 seconds of media data it has already parsed in the source buffer. sourceBuffered() will reflect what data, if any, was kept. The media element resets the segment parser so that it can accept a new initialization segment. The stream ended normally without any errors. Change the sourceState attribute value to SOURCE_ENDED. Notify the media element that it now has all of the media data. Playback should continue until all the media passed in via sourceAppend() has been played. The source has been opened by a media element. sourceEndOfStream() has been called on this source. When the media element is created sourceState must be set to SOURCE_CLOSED (0). sourceopen Event When the source transitions from SOURCE_CLOSED to SOURCE_OPEN or from SOURCE_ENDED to SOURCE_OPEN. sourceended Event When the source transitions from SOURCE_OPEN to SOURCE_ENDED. sourceclose Event When the source transitions from SOURCE_OPEN or SOURCE_ENDED to SOURCE_CLOSED. The media element waits for the necessary media segments to be passed to sourceAppend(). The web application can use sourceBuffered() to determine what the media element needs to resume playback. The following steps are periodically run during playback to make sure that all of the source buffers for the active IDs have enough data to ensure uninterrupted playback. Appending new segments and changing the set of active IDs also cause these steps to run because they affect the conditions that trigger state transitions. The web application can monitor changes in readyState to drive media segment appending. The bytes provided through sourceAppend() for a source ID form a logical byte stream. The format of this byte stream depends on the media container format in use and is defined in a byte stream format specification. Byte stream format specifications based on WebM and the ISO Base Media File Format are provided below. If these formats are supported then the byte stream formats described below MUST be supported. // Error fetching headers. Signal end of stream with an error. // Append clusters from the new playback position. This section contains issues that have come up during the spec update process, but haven't been resolved yet. The issues and potential solutions are listed below. The potential solutions are just initial thoughts and have not been subjected to rigorous discussion yet. Since user agents may have different limitations on how they handle media segment overlaps, the web application needs a mechanism to detect the user agent's capabilities. We have briefly discussed adding a parameter, similar to 'codec', to the MIME type passed to sourceAddId(). We have not discussed any specific details beyond that. There have been some discussions about adding a method that applies an offset to the timestamps in media segments. Ad insertion and mashups where the content being appended does not have timestamps that match the desired location in the presentation timeline are the primary motivators for this feature. A method along the lines of sourceTimestampMapping(presentationTimestamp, segmentTimestamp) could specify the timestamp mapping to use for future media segments that get appended. The mapping would be applied at append time before the data goes into the source buffer. Adding a feature like this would prevent the web application from having to rewrite timestamps in the media segments. The exact semantics and details of this feature still need to be worked out. The current text focuses on behavior for audio and video. Behavior for timed text still needs to be defined. This proposal may overlap with portions of the Audio WG draft. Further investigation is needed around how these two proposals will work together. Specify a way to identify which source ID an AudioTrack or VideoTrack is associated with.